The Teyler Museum in Haarlem was founded in consequence of a bequest of Pieter Teyler van der Hulst (died 1778), a wealthy Haarlem merchant. The collections of the museum include objects of natural history collection of fossils, minerals, historical scientific instruments and paintings by Dutch artists of the 19th century, and a collection of etchings and drawings by earlier masters. The museum was designed by architect Leendert Viervant (1752–1801) in 1779. The old building has been enlarged by a wing in the Renaissance style, erected in 1894 on the side next the Spaarne. The Teyler Museum is the oldest museum in The Netherlands. Visit the official website of the Teyler Museum Haarlem. 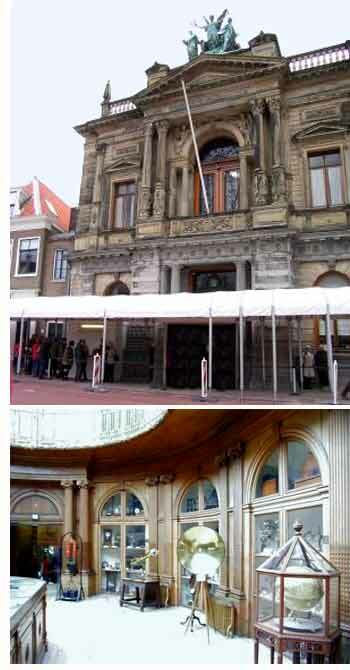 See Location, Map and Satellite images of the Teyler Museum Haarlem in the Netherlands .